In Gravity Beyond Einstein? Part I: Physics and the Trouble with Experiments, Hauser and Dröscher review the latest experimental results in quantum physics and astrophysics, pointing out how unfulfilled predictions and contradicting experimental results have repercussions on the advanced physical theories that go beyond both the standard model of particle physics and cosmology. I have previously made reference to Part I (published April of 2017) and am providing this recap since Part II is now being readied for publication. As promised by the authors, Part II goes deep into the fundamentals behind their framework, enumerating its theorems and impact on competing theories extending the standard model. For both papers I had the honor of engaging in numerous e-mail discussions and literature hints with Jochem Hauser, as well as making edits to improve the style, clarity, and contents of the papers. In Part I the authors argued that fundamentally novel ideas are needed to be in accordance with all of the experimental findings representing efforts to discover new particles. In Part II the physical model EHT (Extended Heim Theory) is presented employing three completely novel and alternative concepts, namely, Heim space H8, an internal eight-dimensional gauge space and a classification scheme for all existing particles and fields. Heim space is proposed in conjunction with an extra system of numbers (replacing the concept of extra dimensions) from real (ℝ) to complex (ℂ), quaternionic (ℍ), octonionic (), and sedenionic () in order to set up a much larger class of physical symmetries. These concepts are then combined with the extension of four-dimensional (Minkowski) spacetime by a so-called dual space (imaginary time coordinate) to explain the location and nature of both dark matter and dark energy. This recap serves as a prelude to Part II, which details replacing the extension of spatial dimensions by an extension of the field of numbers, postulating a relationship between numbers (those beyond real and imaginary numbers) and physics. In Part I, the authors divide the experiments to be reviewed into three classes. The first are those that question the fundamental concept of these theories, namely, missing particles and the existence of extra spatial dimensions. The second are those whose results appear to contradict each other. The third are those rare experiments that hint at the existence of additional gravitational fields. This is significant since supersymmetry (SUSY), a major part of the “super theories,” is used to unify the two different concepts of matter and force. Yet nothing has been observed in this range. No supersymmetry particle in the range of 750 GeV has been detected. 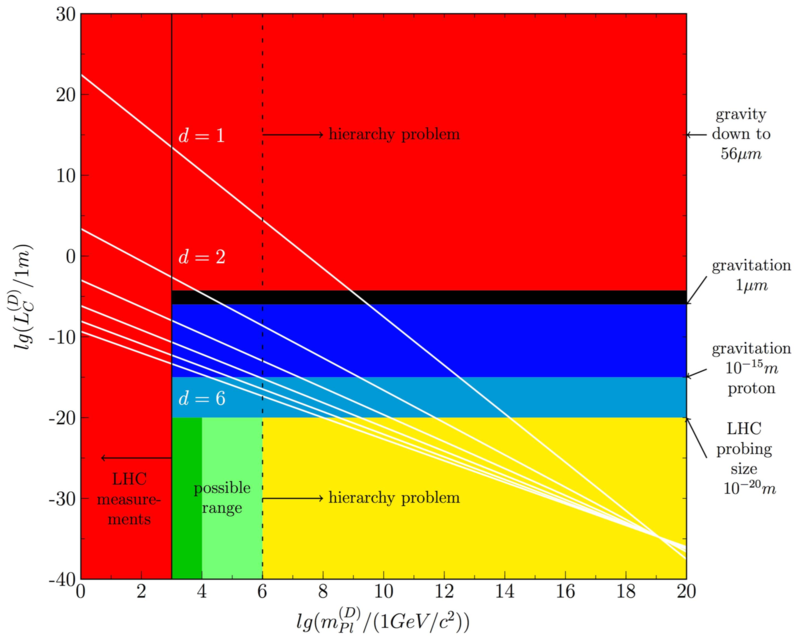 This lack of stable superpartners impacts the proposed stability of particles in the standard model. The Supersymmetric Model posits that heavy subatomic particles influence the electron to alter its perfectly spherical shape. In 2014 the electric dipole moment of the electron determining the shape of an electron’s charge was confirmed to be perfectly spherical (and improved methods this year increased the accuracy of those findings an order of magnitude). Since the electron’s charge is perfectly spherical it disproves the prediction of supersymmetry. The concept of dark matter was invented by the Caltech astronomer Zwicky in 1933 to explain the missing matter in the Coma cluster. Dark matter is the glue that is holding galaxies together, yet no dark matter particle has been found. The proposed neutralino with a mass of about 1 TeV/c2 was not found by the LHC, nor have other leading candidates for dark matter particles been found.No evidence for dark matter has been found within 4 kpc above or below the galactic plane, confirming the absence of dark matter in the solar neighborhood. Dark matter appears to be missing within galaxies, suggesting that if it is a particle it has unusual characteristics.Finally, the total absence of dark matter particles is not in accordance with the hot Big Bang concept. The hot Big Bang requires an unphysical event, namely the existence of a very high-energy density concentrated in an exceedingly small volume. The assumption of an initial false vacuum will not solve this problem. The fundamental question, how such a configuration (enormous amount of energy trapped in a small volume) should have come to exist at all, still remains. Extra dimensions are supposed to provide the means of escaping the physical constraints imposed by the three spatial dimensions of our perceptible four-dimensional spacetime. If the leading theories of particle physics including string theory, supersymmetry and supergravity are to be correct our Universe must be higher-dimensional. That is, more than three real spatial dimensions must exist, as postulated by T. Kaluza in a letter to Einstein in 1919. In 1921, Kaluza’s extension of Einstein’s GR was finally published utilizing a five-dimensional theory. Later, in 1926, Klein postulated a curled up microscopic fifth dimension in order to be in agreement with quantum mechanics.The hierarchy problem is the large discrepancy between aspects of the weak force and gravity. There is no scientific consensus on why, for example, the weak force is 1024 times stronger than gravity. If curled up, the curvature of spacetime in the fifth dimension would account for electromagnetism, unifying the weak force and gravity. However, experimental constraints known since then put a stringent limit on the size of the microscopic fifth dimension and is inconsistent with quantum electro-dynamics. Therefore, a five-dimensional world is now experimentally ruled out down to the microscale.As the authors note, “According to EHT, physics cannot be constructed from pure geometry (e.g. spacetime), because this goes against the governing fundamental physical principles… This means nothing less that the principle of duality is at the foundation of the entire Cosmos (order), governing the physical world, and therefore the two most basic, but complementary (dual) physical entities, namely, spacetime and dark energy both have to be generated at the same instant of time. The most general aspect of duality is represented by symmetry formation and symmetry breaking.” Duality is a key construct of EHT and may doom attempts for the unification of all forces. The second set of questions involves contradictions and gravitational phenomena. Two different types of experiments are presented that are independent on the existence of higher dimensions, but whose results are totally unforeseen and cannot be explained by either the SM of particle physics or any of the so-called advanced physical theories. The outcomes of the first experiment might be explained by utilizing quaternions developed over 150 years ago by Hamilton to extend complex numbers. The second experiment might indicate new forms of symmetry breaking at low temperatures in conjunction with novel types of gravitational bosons. Depending upon the method employed (whether muonic hydrogen where the electron is replaced by the much heavier muon particle, or by scattering measurements) different values are found for the radius of the proton. EHT proposes that the physics going into the precision measurements of the proton is not complete. By extending the system of numbers from real to quaternionic or octonionic, the solutions of the equation of the Planck mass will allow for material particles that may have positive real, negative real, or quaternionic masses. The two different measurement techniques, the bottle (counting the number of the remaining neutrons) and the beam (counting the number of the resulting protons) methods, have measured a difference in the neutron lifetime of eight seconds, which is significantly larger than the measurement uncertainty. It seems that some of the protons have disappeared, not obeying the normal decay scheme of the neutron. The influence of a new particle has been ruled out since none in the mass range have been found by the LHC, but the difference might be influenced by hypercomplex matter (matter flavor) derived from octonionic algebra. Part I also reviews the completeness of General Relativity and novel physical phenomena in the form of extreme gravitomagnetic fields. So far, GR has passed all experimental tests and observations. This, however, does not mean that novel physical phenomena cannot exist beyond the scope of GR. Any valid theory of relativity must give the same predictions as Einstein’s GR. Consequently, any modification of the gravitational law (e.g. the MOND hypothesis, employed to match observed rotational velocities of star systems about the galactic center) has to be rejected. Nevertheless, it is correct to state that the numerical predictions of the debated MOND hypothesis have been confirmed by the recent measurements of McGaugh. If not MOND, what is the gravitational phenomenon responsible for the MOND acceleration as measured by McGaugh? A very comprehensive discussion on the topology of the Universe can be found in the recent comprehensive book by Ringström. The CDT (causal dynamical triangulation) model of quantum gravity is non-perturbative (i.e., can be calculated by known procedure rather than by successive approximation). These computer simulations have revealed that spacetime in the absence of matter possesses a de Sitter topology and thus is that of a simply connected manifold with only one direct path for a light ray to travel from a source to an observer. That is, there are no holes representing short cuts through spacetime. Thus faster than light motion in GR via wormholes is ruled out by CDT and topologies do not seem to allow traversable wormholes. Another mystery is discussed, namely the contradictory measurements of the gravitational constant. Measured results of the gravitational constant have failed to converge and different measurement procedures are delivering substantially different numerical values. Recently, several new experiments have been reported to measure Newton’s gravitational constant GN by applying different measuring techniques. These experiments have resulted in widely different numerical values for GN, which means that a deviation occurs as early as the third decimal place. EHT proposes that GN is the sum of both a gravitational constant for hadrons plus a gravitational constant for leptons (a further gravitational constant needs to be introduced for the interaction of luminous matter with the vacuum field). One of the most significant proposals of EHT is the interaction between gravity and electrodynamics through bosons carrying gravity-like forces (most recently termed “e-gravity”). During the past two decades, several experimenters have reported on the generation of extreme gravitomagnetic or gravity-like (acceleration) fields in the laboratory up to 18–20 orders of magnitude larger than predicted by the Lense-Thirring effect of GR. There are three different possible experimental sources for extreme gravitomagnetic experiments. From 2006-2011 Tajmar et al. published a series of experiments claiming to have observed extreme gravitomagnetic and gravity-like acceleration fields produced by rotating cryogenic Nb rings. The strength of these fields was up to 18 orders of magnitude larger than predicted by GR and would be equivalent to the gravitational field produced by a white dwarf star. In 2007, a similar experiment was published by Graham et al. utilizing a rotating cryogenic lead disk. Subsequent papers by Tajmar altered the experimental configuration of the apparatus, but with each modification a smaller effect was achieved. Graham’s study was not conclusive because the sensitivity of the laser ring detector was too low to provide a satisfactory statistical result. The third study, Stanford’s Gravity Probe B (GP-B) experiment, produced anomalous results defying predictions and delaying the evaluation of the final data for several years. GP-B was launched into a 640-km low earth orbit (LEO) in 2004. It was not devised for the detection of extreme gravitomagnetic or gravity-like fields but might have inadvertently generated these fields in the cryogenic ambience of space as its Nb spheres were spun at high rates. Such fields require the existence of additional gravitational bosons not disallowed by GR, and despite not being predicted in the string theories, they were predicted in 2004 by the physical model of EHT. The section Advanced Theories and Retarding Experiments reviews how recent experimental data and astronomical observations most likely contradict the underlying concept of extra spatial dimensions, which are at the root of all the advanced physical theories beyond the standard model. Yet particles predicted by the super theories, as the authors state, “…have not been found, nor does it seem that the underlying concept of extra, curled up spatial dimensions holds up to physical reality. Hence, the physical concepts of, e.g., superstring theory (10 dimensions) … appear to be mathematical entities only.” They continue, “The existing extensions of the SMs for particle physics and cosmology in the form of string theory, supersymmetry, higher dimensions, Anti-de Sitter space, moduli spaces, loop quantum gravity, and much discussed wormholes are suggested to not reflect physical reality but, rather, are only mathematical constructs not realized by Nature.” Alternative physical principles that could replace advanced physical theories in higher dimensions would suggest more than four fundamental forces in Nature. The mere belief of the existence of four fundamental forces is not sufficient. That being said, the question therefore arises whether there are any additional fundamental physical interactions? If so, might they include gravity-like forces? The next section on Gravitational Engineering covers how two proposed additional gravitational forces could couple with electromagnetism to generate propulsive forces for spacecraft and other uses, and how the extreme gravitomagnetic fields generated would have far reaching consequences for technology. Yet it does require novel physics. In EHT there exist three different gravitational constants termed Gp, Ggp, Gq, where Gp is defined as the gravitational hadron-hadron coupling constant, contrasted with the gravitational hadron-lepton interaction denoted by Ggp. The gravitational interaction between two atoms is given by Newton’s constant GN = Gp + Ggp. If the interaction with the spacetime field is included, then the gravitational constant is named after Einstein GE = GN + Gq which is discussed in greater detail in Part II. Discussion continues on the Physical Reality of Extra Dimensions. The authors suggest that the concept of extra real dimensions could be replaced by the idea of extra number systems. Recall that extra real dimensions are part of superstring theory. Superstring theory is a shorthand for supersymmetric string theory because unlike bosonic string theory, it’s the version of string theory that accounts for both fermions and bosons and incorporates supersymmetry to model gravity (i.e., supergravity). Yet no predicted supersymmetric (SUSY) particles (e.g. neutralino, squark, antisquark) have been found. None of the physical features that are based on the existence of extra spatial dimensions have been confirmed. … but on the small scale, namely on the galactic scale, the model is not capable of reproducing the angular momentum of galaxies, according to observations. The authors conclude by saying that, “… a paradigm shift in our understanding of the Cosmos should be considered… concerning the nature of matter as well as physical reality.” They believe that Nature has chosen a different path than utilizing extra dimensions and that an extension of the system of numbers is proposed as an alternative, as extensively discussed by Sir Roger Penrose, leading to both different types of symmetries (groups) and suggests additional types of matter. Author’s note: The notion of extended number systems as predictors of physics has been considered by Penrose and also by others. For example, mathematician Cohl Furey built on the work of Murat Günaydin on the relationship of fundamental physics to pure math and suggests that the forces and particles that comprise reality spring logically from the properties of eight-dimensional octonions algebra. Furey has written how use of octonions in Gunaydin and Gursey’s early models show quarks and anti-quarks, but that extending those models results in a set of states behaving like the eight quarks and leptons. This mirror’s EHT’s eight-dimensional “Heim space” to describe every group of particles and forces through its derivation of physics from quaternionics, octonionics and sedenionic (to explain coupling constants). Hauser and Dröscher use octonions to lead to the novel concept of matter flavor and explain the different measured lifetimes of the neutron (as will be reviewed in Part II).